I am more than 400 hundred miles from home in San Pedro, CA. I flew down on Friday to visit my dear friend from college days. She and I will be attending the National Inclusion Project event in Los Angeles today. What a treat to spend the afternoon chatting with Jerry, Faye, and Tonya about the exciting plans ahead for the Project. The invitation says: “Prepare to be a kid again!” Well, Why not! Let’s spread the word about Inclusion and have a fun at the same time! Now we get to my third pick, and if you didn’t think I was serious about Ron Paul or Justin Bieber, let me assure you I’m absolutely serious this time. 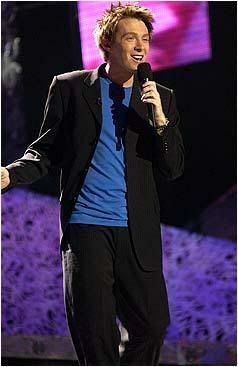 Clay Aiken would make a fantastic choice as an American Idol judge. It’s way past time to get a former competitor on the show as a judge, who knows exactly what it’s like to go from zero to hero and endure all the stresses and strains of the competition, rolling with the format while still trying to stay true to yourself. Thanks to watching Aiken on The Celebrity Apprentice this season we know he’s smart, hard-working, and understands how reality TV works. He’s not afraid to stand his ground and call BS on people when they deserve it. How refreshing. The show needs a judge who can offer a knowledgeable critique to the singers with some bite to it, someone the singers would respect. Aiken would command much respect from the competitors, because he’s been there, he’s talented, and he knows the business. He isn’t afraid to hurt someone’s feelings when honesty will do them more good, and he isn’t a burnout who loses focus and occupies his own orbit. Finally, Aiken also has extremely loyal fans. The Claymates helped him raise a ton of dough on Apprentice. There are websites galore devoted to all things Aiken. They will watch, they will vote. Ratings gold. Aiken is also part of Idol’s roots and glory days. I say it’s a winner. You know I’m right. Claymates, get to work and get the campaign started! This is a great article and I agree that Clay would be amazing on the show. What do you think? To make the article more fun, Clay got on twitter Friday afternoon and re-tweeted some of his followers that had posted their support of his role as a judge. You Go Clay! So…why not tweet American Idol and let them know how you feel. 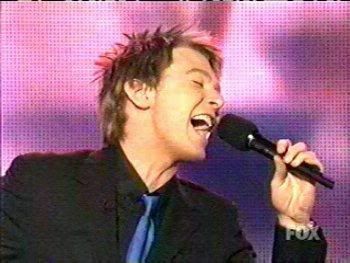 I haven’t watched American Idol for years, but I sure would start watching if Clay was on the show!! I will take some pictures of the National Inclusion Project event this afternoon and post about the exciting event. I fly home tomorrow evening so I will catch up at that time. Please check in to get a full report. The following are some fun pictures of Clays days on American Idol. WOW!! It was fun watching him on TV each week! Gosh! Don't we all agree with what the Gayle lady had to say!!! Clay is "All of That" and then some! Musicfan – Have a great meeting with all from NIP and thanks for all of the great pics – as always! Will look forward to anything you bring back from this meeting. I would start watching Idol again, too! But only if Clay was Judge! Just can't think of a better judge. Mr. Aiken would truly bring the knowledge, the humor, the insight that is so needed in this competition. He went through it all, and can give so much back. For sure he has my vote! Musicfan..Have a great time at the National Inclusion Project event in Los Angeles. Can't wait to hear all about it. It was fun last evening tweeting and retweeting. Even Arsenio go in on the action. Saw a clip of Clay being a judge on David Foster's Star Search from a few years ago, and he is really, really good at it. He critiques the person, on what they can do to improve, gives them constructive criticism. He would be amazing at judging and doesn't pull any punches. Must be the teacher in him, trying to bring out the best in people. Yep it sure WAS fun watching him every week, kinda like Apprentice, *g*. I miss him! I DO watch AI every year. Not so much to find the NEXT American Idol, but to get together with my girlfriends each week to watch, eat dinner, drink wine and enjoy their company. I just enjoy the singing. Don't vote either, but we enjoy the journey. I think Clay would make a fantastic judge. He's judged I think in Canada one time, right?. He was very good. I wouldn't have thought he'd be interested until we saw the retweets he posted from fans voting for him. Go Clay! I would love love love to see Clay as a judge on AI but I’m not going to get my hopes up. They’ve not had him back on the show in years so I doubt they will start now. I did send a tweet and comment to the Times article though. I will be glued to my seat every week if they choose Clay as a judge. I have heard talk of Adam Lambert judging–who I cannot stand. I wouldn't even watch the season if he was a judge. I totally agree, I would love to see Clay as a judge on AI, he would be great and what a treat to see him every week, hope he gets picked. Saw a youtube clip yesterday of David Foster’s 25th anniversary celebration of his charity. There were 2 photos of Clay performing. Later saw photos of the evenings festivities and Ruben Studdard was sitting with Michael Joseph at a table. Wonder if Clay was in attendance? Clay would be outstanding as a judge on AI. Gayle’s statements were spot on. There is talk of Adam Lambert as a judge. No thanks! I copied down a fairly recent comment about Clay that described some of the reasons I think he should be considered as a talent judge on American Idol. Quote – "Clay has amazing talents. He is super smart, caring, determined, classy, easy going and a genuinely good, likeable guy." In addition, Clay also has impressive vocal ability and perfect pitch. He exhibits charismatic ease in front of a camera and is very funny and witty. These, and the above quoted attributes, certainly seem to make Clay an ideal candidate to judge a singing talent competition. Maybe it will become a reality, hopefully….. Yes I do think Clay would make a great judge….however I don't think he would be interested. I do not believe he has such a good re-pour with the powers to be at AI. I have always thought it would have been great fun to bring back various AI alums to be guest judges….maybe not for the entire season but weekly! Enjoy your day at the NIP Event in LA. We will be waiting for your pictures and what went on. Thank you for the pictures of Clay on AI. He sure was a cutie patootie. PUT THE PAST BEHIND,PLEASE LET CLAY BE JUDGE HE THE MAN FOR THE JOB.GOD BLESS. LETS ALL VOTE FOR CLAY. I agree that Clay would be a great judge for all the reasons she mentioned. I think Kelly Clarkson could also do well as a judge. How about Clay and Kelly as full time judges and the 3rd spot is a different Idol alumni every week? Perhaps those that made Idol the success it is can keep the ship from sinking. I too would love to see Clay on AI as a judge. He would fair and honest with the contestants. I loved looking at the old pictures of Clay on AI. I know you will have a wonderful day with the National Inclusion Project. I am glad that you were able to go and I hope you will share your day with us. Could Clay do an incredible job as an AI Judge? Oh Yes! Would his participation bring back viewers? Yes, myself included. Why do I think Clay would be great besides the fact that I'm a fan? His focus would be on the contestants and the goal of discovering talent and not self promotion like every new judge since the original 3. I much prefer the format of SYTYCD by Nygel Liythgo also behind Idol.. Should Arsenio join Clay? Absolutely NOT. Batman has his own show already. Clay needs to put a nail in that whole Robin thing of Arsenio's – I like their banter at times but Clay is not Arsenio's joke for a partner. Clay needs his own separate gig! That being said however, Arsenio could have first dibs after Ryan Seacrest to interview contestants after elimination and do behind the scenes reporting that includes goofing off fun with Clay. That would be fun to see. Do I think AI would welcome Clay? I have doubts because of the people with the recording rights to AI winners.. Do I think it would be a smart move for Clay? I would love to see him on TV but it could be risky. Although we want it, it is his happiness that counts! Error: Error validating access token: Session has expired on Tuesday, 21-Aug-18 16:13:01 PDT. The current time is Friday, 26-Apr-19 01:31:10 PDT.